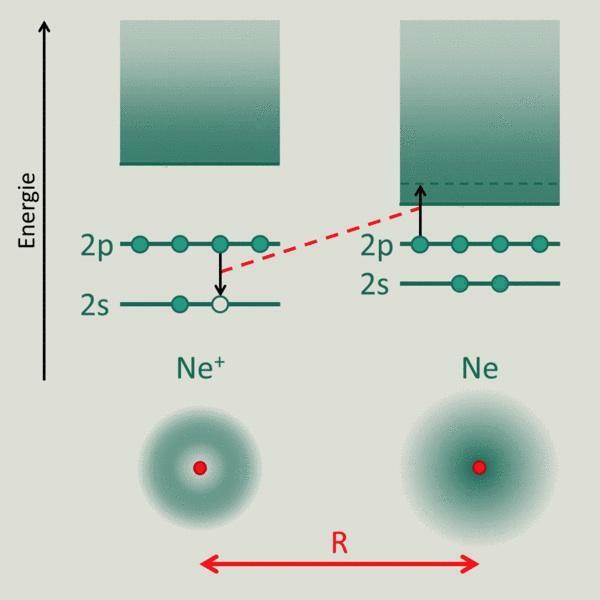 At DESY's free-electron laser FLASH, an international team of scientists has measured the duration of a radiationless energy transfer between atoms of a neon dimer directly for the first time. The efficient redistribution of energy in molecular systems after exposure to high-energy radiation is of fundamental importance for numerous chemical and biochemical reactions. For the energy transfer in atomic and molecular systems, radiationless processes after the exposure to high-energy radiation play a major role. Particularly for light atoms, these processes are often much faster and more efficient as compared to the emission of light (fluorescence). Many chemical or even biochemical reactions are determined by the redistribution of energy which – absorbed at a certain point – may cause an internal movement or the break of a chemical bond at another point. In many cases, the energy is transferred through the electron movement, but the electric force between electrons alone is sufficient for an efficient energy transfer – even over longer distances (on the atomic scale). An example for a very efficient energy transfer between loosely bound atoms is the so-called Interatomic Coulombic Decay (ICD), predicted at end of the 1990s by Lorenz Cederbaum, professor of physical chemistry at the University of Heidelberg. The image illustrates this process, taking as an example a neon dimer (Ne2) which consists of two very loosely bound neon atoms. First, through exposure of high-energy radiation (e.g. absorption of UV light), an inner electron (state 2s) is removed from one of the two neon atoms. Subsequently, the remaining ‘hole’ is filled with one of the outer 2p electrons. Because this energy is not sufficient to kick out another 2p electron (atomic Auger effect) a single atom can only stabilize through the emission of light, which takes place relatively slowly (within a few nanoseconds). If – as in the case the dimer – another neutral atom is in the neighbourhood (distance R), the energy will be meditated radiationless, leading to the release of a 2p electron. The energy transfer takes place through the electric (Coulomb) interaction of both active electrons. Various investigations have shown that the ICD is very efficient and fast, but it was so far not possible to directly determine in an experiment the speed of this process. Now, the group headed by Robert Moshammer from the Heidelberg Max Planck Institute for Nuclear Physics (MPIK) succeeded to measure this for the first time. At the free-electron laser in Hamburg (FLASH) the scientists exposed neon dimers to extreme UV radiation, using pairs of intense light flashes with adjustable time delay. “With the first flash, we create a 2s hole in one of the two atoms and with the second flash we check whether the second atom was already ionised by ICD,” said Kirsten Schnorr, PhD student at MPIK. The result is that the ‘wireless’ ICD energy-transfer typically takes 150 femtoseconds (10–15s). This is extremely fast in comparison to the above mentioned florescence, but still about 100 000 times slower than the period a light beam would need to travel the distance (R) across the dimer, from one atom to its neighbour. It follows that the speed of the lCD is determined by the time it takes to fill the 2s hole. As common to all quantum processes of this kind, this happens randomly within a specific lifetime (half-life time). The energy transfer via ICD comes into play whenever an excited atom can release its energy without radiation to the environment. Among others, this process was also identified to be active in clusters of H2O molecules which are loosely bound by hydrogen bonds as well. The ionisation of the environment via ICD is also relevant for biological systems and tissue (radiation protection and therapy). The experimental data, which have been accepted for publication in the journal „Physical Review Letters“, are very much in line with theoretical predictions, but only if the motion of the Ne atoms during the short time between excitation and ICD is taken into account in the calculations. Further experiments will investigate this dependence. Time-Resolved Measurement of Interatomic Coulombic Decay in Ne2; Kirsten Schnorr et al. ; Physical Review Letters, accepted (2013).